I've written about polyomino covers and colorings of polyomino tilings elsewhere; I intend to use this page for miscellaneous polyomino related topics that don't merit a seperate page. While finding magic 45-ominoes manually (I used stones on a go board) was a fun puzzle, I thought at one point that it would be nice to turn the problem into a product that I could either sell or give away as a freebie with the purchase of one of my laser-cut puzzles. I came up with a nine tile puzzle where for each number between one and nine, there was a tile with that many squares in a 3×3 grid, in different patterns on either side of the tile. Since there can obviously be only once such pattern for nine, the back of the "nine" tile made a convenient place to put instructions. The beta version of this puzzle is available here: front, back. Note that the URL on the instruction sheet is for my old, abandoned puzzle selling site. I believe that I have lost the source files for the PDF's, so I do not plan to fix them. I'm making the puzzle available under a Creative Commons license. If you make your own version of the puzzle, let me know; I'd love to link it. I suggest printing out the front and back on seperate pices of cardstock and then gluing them together. Notice that nowhere do the instructions state that the solution must use a magic square. Deriving that fact is part of the fun of the puzzle, which I have sadly ruined for you. Sorry! This was a fairly challenging puzzle to solve by hand, although once I got the hang of it, I was able to find a fair number of solutions. The '8' cell in the upper right is a little tricky to keep connected to the rest of the polyomino. I've since written Python code to find all of the magic 45-ominoes. There are 182 of them, of which 12 share the property of being hole-free like the one shown above. I've made a Sudoku variant using a Magic 45-omino. It's on my Grid Puzzle page. I've used colors to denote the labels; from lightest to darkest, the shades used represent 1 through 4. The July 2009 Math Magic Problem of the Month contains an exploration of similar problems involving polyominoes with different weights associated with their squares. These appear to be all of the unshrinkable 8-sided polyominoes. (Depending on how you want to define the set, the one with the hole could be excluded.) I call a polyomino shrinkable if there is a grid line intersecting the polyomino such that wherever the cell on one side of the line is inside the polyomino, the adjacent cell on the other side of the line is also inside. One could shrink the polyomino by replacing the pair of rows of cells on either side of the line with a single row that has the same pattern of cells within the polyomino. The number of unshrinkable (n*2)-sided polyominoes appears to increase very rapidly with n. Consider the subset of these polyominoes which are permutations of stacks of squares of height 1 to n - 1. The number of polyominoes in just this subset is (n - 1)!/2. You could certainly look at unshrinkable subsets of other sets of polyominoes. My motivation for looking at unshrinkable (n*2)-sided polyominoes was that it produced a finite subset of an infinite, (and thus rather unwieldy,) set. Also, since shrinking polyominoes preserves the number of sides, the unshrinkable (n*2)-sided polyominoes could be looked at as canonical members of equivalence classes, where all polyominoes that eventually shrink to the same unshrinkable polyomino are equivalent. 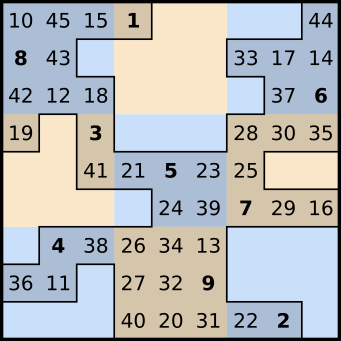 It's possible to arrange a set of pentominoes so that 11 of them border and surround the twelfth. First, notice that not every pentomino can serve as the central piece. The central pentomino must have at least 11 neighboring cells. The I pentomino has 12 squares bordering it, the L and V pentominoes have 11, and all of the other pentominoes have fewer. A pentomino that occupies the cell on the inside corner of the V must also occupy one of the neighbor cells next to it, so the V pentomino doesn't work. It's a little harder to find a convex solution. When we talk about convexity in polyominoes, our definition of convexity is a little different from the standard definition. Normally, if a shape is convex, we should be able to pick any two points within it and the entire segment connecting them will lie within the shape. If we can pick two points for which this isn't true, it's concave. For polyomino "convexity", we add the restriction that the two points we choose have to be on the same vertical or horizontal line. If the line between them is diagonal, it can't affect convexity. For another challenge, you can try to find a symmetrical, (not necessarily convex,) solution. I haven't found such a solution, and I don't know if one exists. What if we we turned this defect into a virtue? There are 9 tetrominoes with a notch cut into a grid point on one of their sides. Unfortunately, a parity problem prevents them from fitting into a 6×6 square, but since 7 of them are asymmetrical, the one-sided notch-tetrominoes could fit in an 8×8 square. Is it possible to fit the 16 one-sided notch-tetrominoes in an 8×8 square so that each of the notches is at the point of a T interection, and each T intersection is at a notch point? Gunther Stertenbrink found that it is not. He found two solutions where all of the notches are at a T intersection, however, in both solutions there were extra T intersections not at notch points within the tiling. Are there other notchomino problems with elegant solutions? I was working on the 4×11 rectangle with notch 2-, 3-, and 4-ominoes, and found near solutions with one too many T intersections. It's pretty easy to prove that these are the only hexominoes that will work. Larger polyominoes, polyiamonds, other polyforms. Larger numbers of overlapping tilings. An n×n square can cover all segments in the grid with n overlapping tilings. How about other polyominoes? Normally, we require polyforms in a tiling not to overlap. If we make cyclic chains of pentominoes, each overlapping the next by one square, they can tile 6x8 or 4x12 rectangles. If instead each pentomino overlaps the next by two squares, they can tile a 6x6 square. If a pentomino chain isn't cyclic, it can tile a 7x7 square. Is it possible to make such a tiling where each square of overlap is a knight's move away from the last? Two pentominoes (the I and the X) do not contain a pair of squares a knight's move apart, therefore they must go on the ends of the chain. If you have questions, comments, solutions to unsolved problems, or ideas for new, related problems, please email me.